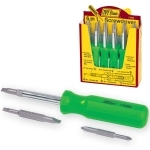 6 Functions: 1/4" & 5/16" nutdriver, No.1 & No.2 Phillips® bit, 3/16" & 1/4" Slotted bit. Chrome vanadium steel bits with ball and spring retention. Ergonomic, textured, comfortable handle. 1/4"& 5/16" hex shanks. Overall Length: 7-1/2".